Left: Rachel and Dr. Oza rehersing the Salsa. Right: Rachel and Dr. Oza at the Paring Party. Dr. Veeral Oza from McLeod Digestive Health Care will be a star participating in this year’s Dancing for Our Future Stars of Florence. His partner will be Rachel Fenters. Dr. Oza and Rachel will be dancing the Salsa to a Bollywood inspired remix of Ed Sheeran’s 2017 hit Shape of You. 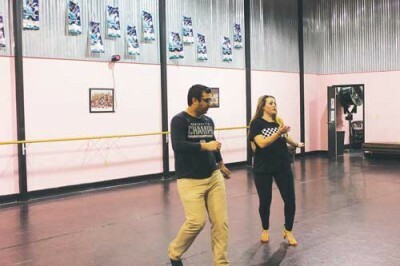 Rachel has been dancing for close to seventeen years, starting when she was three. She took a small break during nursing school. This is Rachel’s first year competing with the Dancing for Our Future Stars competition. She loves working with Dr. Oza saying that “he has a natural rhythm”. Dr Oza has a little bit of dancing experience with his sister. So far Dr. Oza said the rehearsals have been, “fun and an excellent workout. The whole experience has been wonderful and Rachel is a great, patient partner”.